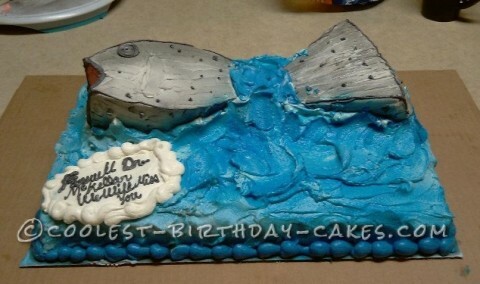 I made this big fish cake for a great friend who is also a doctor who loves to fish. I took an 11×15 and 8×11 and cut out the fish. I shaped the tail and face. The middle is just icing to make it look like the fish is jumping out of the water. This cake took about two hours to make. It was a lot of fun at making this cake. I also do cakes for others. I would like to starting my own business.